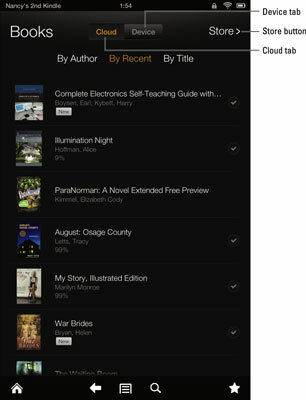 When you tap Books on your Kindle Fire HD screen, you open the Books library, containing downloaded content on the Device tab and content in the Cloud on the Cloud tab. The active tab is the one displaying orange text. There’s also a Store button you use to go to Amazon’s website and shop for books. Grid and List views: Tap the Menu button on the Options bar to display the Grid View and List View options. 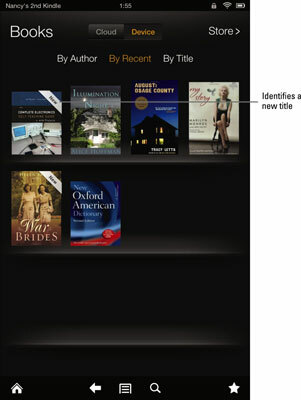 These provide views of your books by using large thumbnails on a bookshelf (Grid view shown) or in a text list including title and author, along with an accompanying small thumbnail. Sort titles: Use the By Author, By Recent, and By Title buttons near the top of the screen to view books by any of these three criteria. 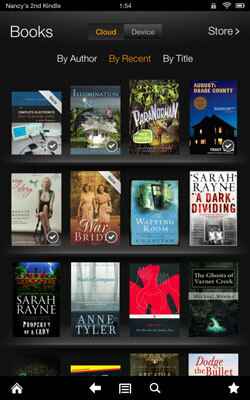 Identify new titles: If you’ve just downloaded but haven’t started reading a book, there will be a banner in the corner of the thumbnail with the word New on it.